However, the similarities in their nature and roles mean they’re often the concepts most mixed up. This confusion can produce vulnerabilities in an organization’s security. As modern security advancements continue to gain complexity, a clear understanding of both concepts is critical. 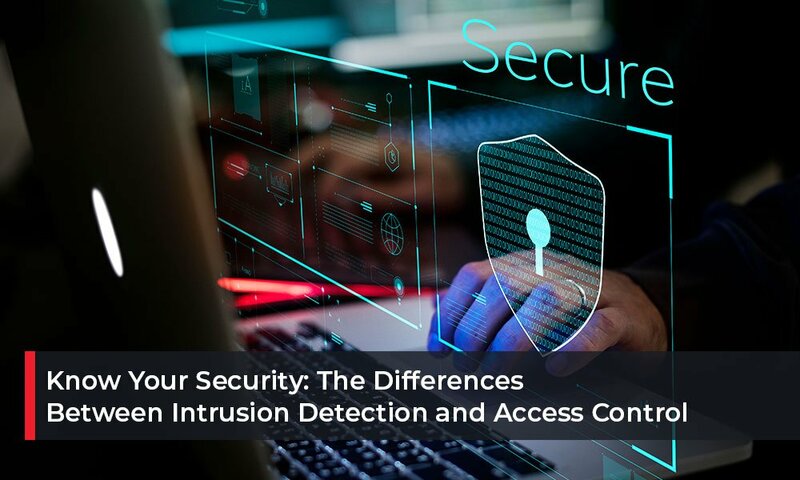 Here’s the difference between intrusion detection and access control, and why each one matters. Access control is the restriction of access of specific people to specific areas with the intention of minimizing unauthorized access of systems, places, or assets. In cybersecurity, this may refer to physical, digital, or logical access. Access control relies on identification and authorization to function properly. To access a restricted area or device, users need to bear proper identification and be accessing restricted spaces for only authorized uses. While this might seem straightforward, implementing effective access control is quite difficult because of the dynamic nature of most industries or businesses. Roles, needs, and priorities change. Organizations need to balance evolving access requirements with security to ensure that access never falls into the wrong hands. Additionally, access control is often guided by regulations and legal requirements. For example, HIPAA, which governs the use, storage, and transmission of private health information, lays down a series of regulations which include access control requirements. 1. Physical Surveillance: Video surveillance software secures perimeters, while other tools such as remote desktop monitoring programs keep an eye on user activity. 3. Host Monitoring: By monitoring devices and machines themselves, host monitoring spots malicious behavior arising from internal actors, and from machines which have been compromised by malware. 4. Anomaly Detection: Many different attack routes occur, but unusual behavior is often a common thread between them. 5. Signature-Based Detection: Since most attacks and access violations have occurred before, robust intrusion detection systems can identify signatures, patterns of behavior associated with attacks. Access control and intrusion detection may seem similar on the surface, but they function in different ways. When combined, these two strategies create a comprehensive blanket of security which keeps a company’s valuable assets safe. Here’s a closer look at how they work together. 1. Access control sets parameters for authorized access and use, making intrusion detection possible. Access control helps set the baseline of normal activity by establishing rules regarding access and behavior. When proper use and normal traffic flows are known, it becomes much easier to spot improper use or intruders. 2. Intrusion detection helps identify and implement access control. Sometimes, intrusion detection may help spot instances where legitimate access is necessary outside the bounds of what is permitted. Repeated intrusion alerts may be the first sign that access control policies may need to evolve. 3. Integrated intrusion detection and access control are synergistic. Good security integration systems use these two techniques together. Intrusion detection and access control produce a synergy which makes both strategies stronger. When both are implemented and managed together, security teams gain the ability to spot more sophisticated attacks which might otherwise escape one or the other. Good security is not optional, and it consists of much more than simply strong passwords and locked doors. Many modern security advancements such as artificial intelligence are revolutionizing the way modern businesses approach security to keep pace with ingenious malicious actors. Access control and intrusion detection are two branches of a robust strategy which keeps data, facilities, and assets safe. Using both in tandem creates a comprehensive and effective solution to stop even sophisticated attacks. Are you not sure if your security solutions are up to par? DSI offers a free assessment to help you get a sense of where best to implement more modern and effective security.